After dropping off our luggage and freshening up at the Subic International Hotel, Jandy and I then returned to our Toyota Revo and hied off to Ocean Adventure Park, nestled at Camayan Wharf in the West Ilanin Forest area inside the Subic Bay Freeport Zone. Once in, we first had to satisfy our growling stomachs, doing just that with much-needed lunch at the park’s 240-sq. m., 70-pax Ilanin Bay Cafe. 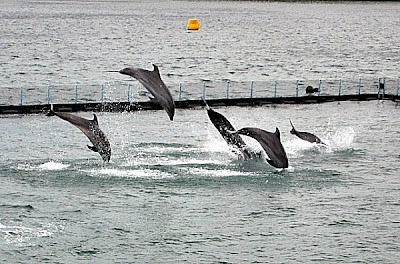 The world-class Ocean Adventure, managed by the Subic Bay Marine Exploratorium Inc. (SBME), is the first and most astounding nautical sanctuary in the country and the first and only open-water marine park facility in Southeast Asia. Opened on September 15, 2001, this 20,000-sq. m. (12,000 sq. m. on land and 8,000 sq. m. on water) park showcases some of the world’s most amazing sea mammals and is home to 8 South American sea lions (Otaria byronia), 6 false killer whales (Pseudorca Crassidens), 4 bottlenose dolphins (Tursiops truncatus gili) from Japan, and porpoises, all moving about in their inherent, natural habitat (not man-made as in similar parks abroad), fenced off only on one side of the shore. 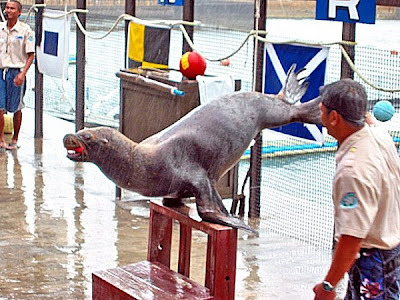 The park aims to provide guests with what they call “edutainment” (educational entertainment), educating the people on marine life and the rich resources people should learn to value and conserve. 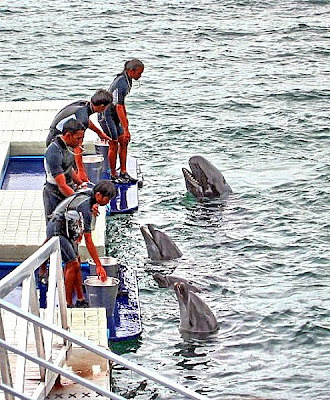 It thus gives the Filipinos an opportunity to truly appreciate the value of marine mammals as partners of humanity in the enormous task of saving our oceans. The park is currently managed by a team of highly trained professionals, all formerly involved with internationally recognized theme parks such as the Hong Kong’s Ocean Park, Walt Disney World and Florida’s Animal Kingdom. 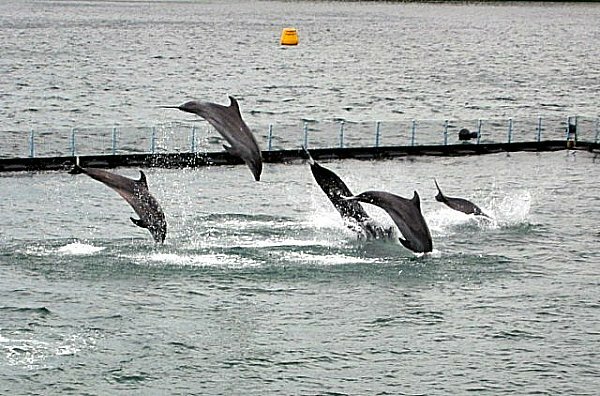 In its effort to protect, preserve and develop wildlife and the forestland, Ocean Adventure also corroborates with the Wildlife in Needs (WIN) Foundation and the Subic Bay Metropolitan Authority (SBMA) Ecology Center, putting up a rescue center within the compound for sick, injured and confiscated wildlife in the Subic Bay area. About 50 injured animals are presently under the care of experts and veterinarians in the facility. The WIN Rescue Center is open for public viewing. Here, visitors can get a peak on how the animals are being cared for and treated. The Animal Care Clinic, a behind-the-scene look at how the animals are cared for, offers visitors a chance to view the actual lab work evaluating individual health parameters of the mammals. The Animal Nutrition Center, on the other hand, is a behind-the-scene look at the kitchen support extended to the animals. Visitors can see how animal food and dietary programs are prepared. The Sea Lion Show, at the 350-seat Nautilus Theater, starred the adorable and amusing showgirls Brandy, Simba and Thalia. They amused us, as well as the audience, with their funny antics. Next on my itinerary was the Whale Show at the 700-seat El Capitan Stadium. In between shows, we visited the 280-sq. m. Ocean Discovery Aquarium. 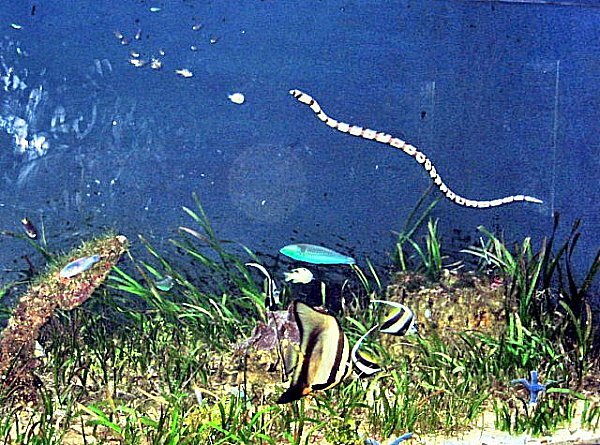 Its arrangement of fresh water and seawater (marine) habitats hosts different species of corals and fishes of the Philippine marine ecosystem, recreating Subic’s marine life at different levels. The Ocean Discovery Aquarium aims to inspire understanding and help promote conservation of the natural environment by providing the public an entertaining and educational facility that serves as base for protective and educational activities, extending into the surrounding forest watershed and bay area. The 50-pax Learning Center, a classroom and library, offers educational materials and information on marine mammals and marine conservation. We also visited the 180-sq. m. Ocean Treasures, the gift shop located by the Entry/Exit gate. The Whale Show, the main attraction, featured the three awesome false killer whales Cook, Founder and Tonka plus some dolphins. After the show, Jandy and I opted to have our pictures taken, petting a dolphin. For the more “adventurous,” the park also offers a “Whale Encounter Program” at the Encounter Cove where guests get to join in and swim with the whales in the water, pet and feed them and have souvenir photos taken with the gentle creatures. 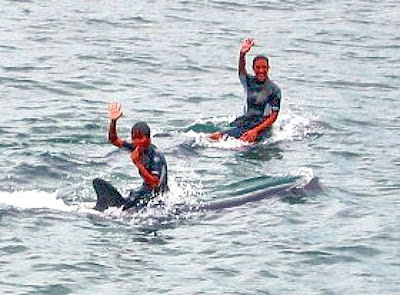 It also offers a “Dive with the Whales Program” and dive courses. Ocean Adventure: Camayan Wharf, West Ilanin Forest Area, Subic Bay Freeport Zone. Tel: (047) 252-9000. Fax: (047) 252-5883. Manila tel: (632) 706-3344 to 46. Fax: (632) 706-0808. E-mail: info@oceanadventure.com.ph. Website: www.oceanadventure.com. This entry was posted in Animal Bonding, Philippines, Republic of the, Theme Parks, Zambales by Benjie Layug. Bookmark the permalink.